The Close command is used to close the file in the active editor window. 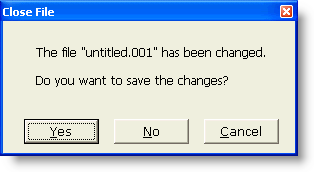 If unsaved changes have been made to the file, a dialog box will first appear to alert you to this fact. You will then be able to choose whether to save the changes before closing, close without saving, or cancel the Close operation altogether. A file can also be closed by clicking the 'X' box in the upper right corner of its window. When a file's window is maximized, the 'X' box will be located at the far right of the main menu bar.